Hi to all you English visitors. Apologies for the only German pages at the moment. This to give you a quick overview and some information using the language you prefer. JLog appeared in the market as an “Early Bird” but also already being late concerning this year’s R/C season. After Kontronik’s decision not to take it into their portfolio we quickly launched it as an assembly kit in a very limited number for a first try (100 pcs.). We convinced Mr. Scholand, a German R/C dealer from Berlin, to take the risk. That’s the reason why all documentation and publication is right now German only. Well, the 100 kits “evaporated” as quick as expected, about 30 more JLog’s went out for beta testers and friends. Presently we’re working on JLog’s “re-incarnation” as a new hardware (new PCB, processor w/ twice the memory, a few more interfaces etc), but also as a pure software module “hosted” by a common purpose logger. The new hardware will continue to have the dimensions of a stamp (20 x 15 millimeters, about 2 grams of weight). In the meantime we hope that Mr. Scholand will fill the gap by some more assembly kits based on a breakout from Sparkfun. 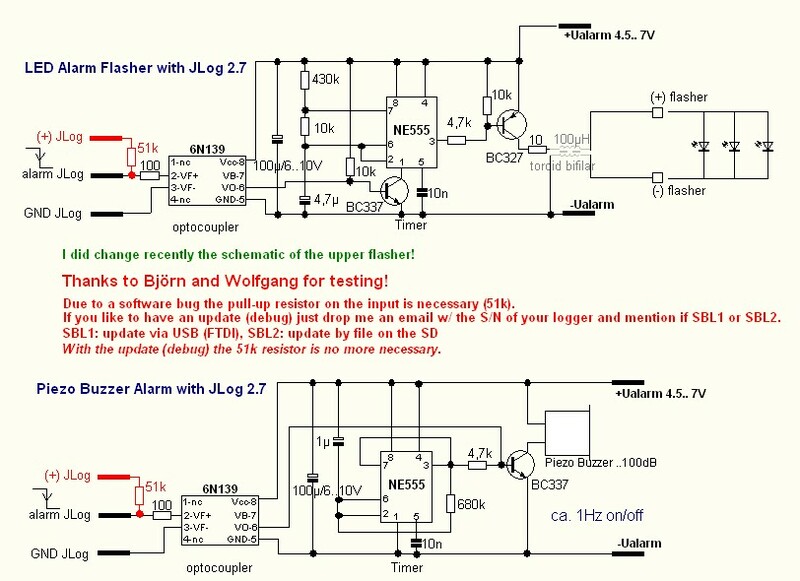 Jlog is a data logger spezialized in doing the log-job for ESCs of Kontronik’s JIVE series (any model, any firmware version). It is a “data logger” in the meaning of the word because it has no sensors, no own shunts for current measurement nor measuring any voltage, RPM or whatever. Instead it reads and analyses “the JIVE protocol” coming out there where the programming jumper of a JIVE to be find. This is a binary block-by-block protocol, rather complex, carrying a huge number of data items (~130). Its development at Kontronik did not intend it for logging purposes than for casual analyzing. Also the measurement taken inside a JIVE was not designed for logging purposes than for monitoring and event-controlled functionality. So Jlog can be called to be a complex “state machine” in processing “the protocol”. On the other hand JLog is a data processor for the interesting values of measurement taken out of a JIVE’s data stream. Especially the raw measurement of the motor current needs to be processed extensively because it is measured behind the Low-ESR capacitors, changing duty cycle and frequency of the PWM as well as reactive current of the motor coil act to forge that current. Main output format of JLog is “OpenFormat” for viewing by LogView. The logger stores it into logfiles in a FAT16 filesystem of a microSD (2GB) and pushes it in parallel out of its serial interface as a live stream for monitoring/logging purposes by LogView on the bench. The capacity of the SD is adequate to store a logged whole R/C season onto it, hypothetical:). PWM-Motor – PWM 0..100%. Important for setup of the RPM governor (modes 4 and 11). IbecMax – maximum value of I-BEC. Helps finding the exact time a peak appeared. ImotMax – maximum value of I-Motor. Capacity Alarm – Logical alarm. Triggered if burned mAh reach a defined limit. Ubat Alarm – Logical Alarm. Triggered if voltage (after integration –> slowing down) drops below a defined minimum. TempPA Alarm – Logical Alarm. Triggered if PA’s temperature exceeds a defined limit. Logical alarms lead into one physical alarm. Serial output connector “Tx” is re-configured to act as a switching output (TTL) if any alarm is configured. Otherwise it keeps to be a serial output for the live stream. Here an example how to source JLog’s general alarm into an alarm device. Notice the extra voltage supply for the alarm device because the BEC may die but we want to signal that also. A dead JLog (because it lost its supply voltage) has to trigger the alarm as well! - You may consider to wirelessly transfer the alarm signal by an ISM device. JLog is configured by a single line of text in a file named “CONFIG.txt” located in the root of the SD card. 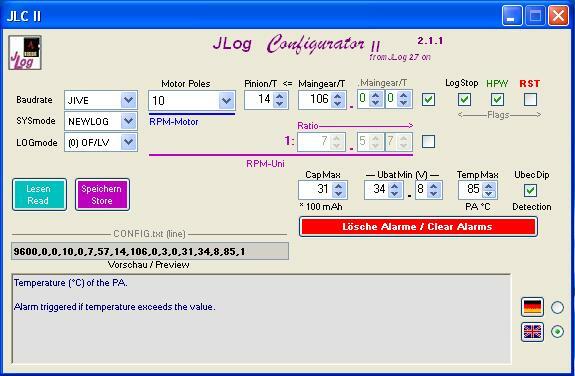 Configuring is done by the “JLog Configurator” - an intuitive tool running on a PC. So the most efficient way to learn more about JLog’s overall function will be to play a bit with JLC-II, the Configurator. JLC’s embedded help is in English also. A main difference comparing JLog with common purpose loggers is that JIVE/JLog is not integrating measured values. Integration leads into RMS-values. JIVE/JLog displays current pulses with real-life amplitudes, I-Motor as well as I-BEC, and also voltages. The latest update of JLog was a new bootloader “SBL-II” for it. SBL-II allows auto-flashing of the logger by a simple update file in the root of the SD card. Flashing is done if the file has the appropriate length, is compliant to the hardware of the device, was encrypted with a key that suits the SN (serial number) of the device and contains a software version of the application (the logger itself) that is different from that currently stored in JLog’s ROM. Furthermore (after flashing) the CRC (checksum) have to be okay, otherwise ROM’s content is marked as being unflashed (ready for a next try to auto-flash the device). Once the next charge starts to deliver we will have everything in English also – as well as a support on an English site. Stay tuned. The story goes on. Look here.